Blackham Resources Ltd (ASX: BLK) has released results from its drill work targeting the down-dip extensions of the Republic Reef at the Matilda Gold Project in Western Australia. The Republic Reef is about 1.5km from BLK’s Wiluna Gold Plant and of the three RC holes drilled so far, only RRRC0002 appears to have intersected the target zone, showing mineralisation of 5m @ 6.87g/t from 448m, including 2m @ 11.5g/t. The three RC holes were drilled to a depth of 1,553 metres looking for similar structural extensions of the Republic Reef as that of the Golden Age system which produced 160,000oz @ 9g/t Au. The Republic Reef was previously mined as a small open pit with limited deeper drilling. BLK’s drilling in the area is in line with this, as it focuses on free-milling gold targets and resources within open pit or shallow underground depths. Last month, BLK announced a funding transaction with Orion Fund JV Limited and Orion Titheco Limited for Orion to provide a structured two-tiered financing package for BLK. Orion is mining-focused investment business with $1.8 billion under management. Orion specialises in providing flexible capital investment solutions to junior mining companies working with base and precious metals. Equity investment of $2,500,000 in exchange for 19,230,769 shares priced at $0.13 per share. The funding facility will then provide subsequent funding to the tune of $30,000,000 to be drawn in two tranches of $15M, for the development of the Matilda Gold Project. As part of the multifaceted deal with Orion, BLK has also agreed for Orion to nominate one member of its Board. Former Managing Director at Barclays Capital Mr. Peter Rozenauers was appointed as Non-Executive Chairman on June 17th, and brings valuable financing and commodities risk management experience to help BLK advance its Matilda Project. Commenting on the facility, BLK’s Managing Director Bryan Dixon said, “We have achieved a great deal since first acquiring the Matilda Project in 2011. 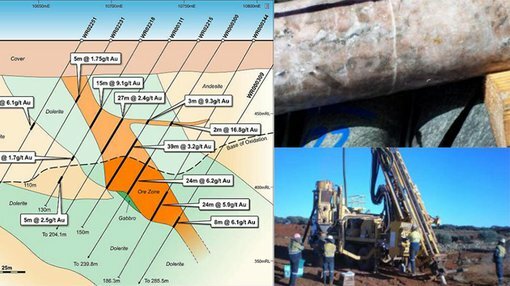 As part of our dilligent exploration work, we have grown our total gold Resource upto 4.7 million ounces, completed over 37,000 metres of drilling, carried out pre-feasibility level studies and completed an initial scoping study for the Matilda Gold Project”, before adding, “the funding facility provides a secure pathway to gold production at our 100% owned Matilda Project. Having achieved what we have in the past 4 years on a limited exploration and development budget, the $30+ million funding facility gives us a chance to step into higher gear”. Final approval for BLK’s deal with Orion is with BLK’s shareholders who will meet at the company’s Shareholder meeting on July 27th 2015. 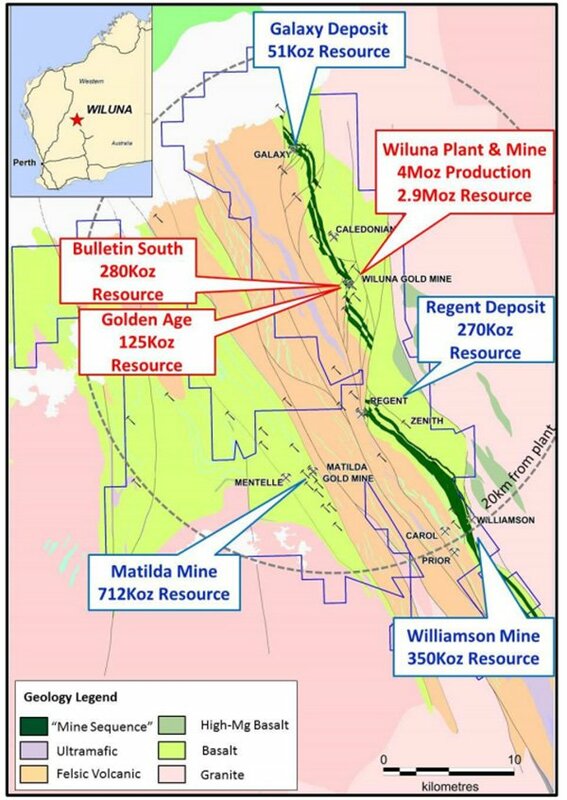 The Matilda Gold Project features more than 780km2 of tenements, including BLK’s Regent and the Matilda and Williamson Gold Mines. These contain JORC 2012 resources of 44Mt @ 3.3 g/t for 4.7Moz of gold within a 20km radius of BLK’s Wiluna gold plant, capable of 1.3Mtpa for over 100,000 oz production each year. Measured and Indicated resources now total 20Mt @ 3.5g/t for 2.3Moz, which represents approximately 48% of the total resource, located in the heart of Western Australia’s notorious Gold Belt. 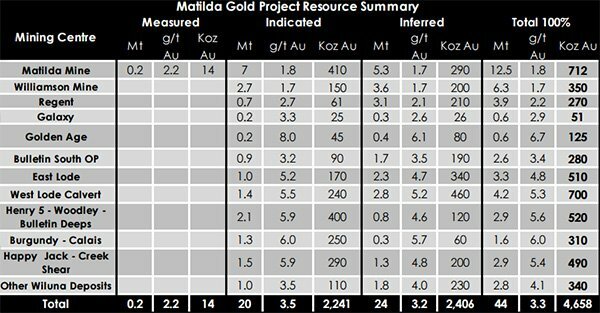 This is a 40% increase in indicated and measured ounces on the previous resource estimate for the Matilda Deposit, which is within the highly prospective Coles Shear, about 20km south of Wiluna. At the time of writing, BLK has a 2,000m diamond drilling program underway at the Matilda Mine and RC drilling is planned to infill the new zones. Dovetailing with other exploration activity, BLK recently received approval from the Department of Mines and Petroleum (DMP) to re-enter the Golden Age area of the Wiluna underground mine. BLK geologists are set to confirm suitable drill pad positions in the coming weeks with a view to further drill the extensions of both the Golden Age and Republic Reefs. BLK intends to commence its maiden drill programme at Golden Age as soon as possible. Golden Age is a high grade free milling reef that has already produced 160,000 oz Au at 9g/t Au and has a remaining resource of 0.6Mt @ 6.7g/t for 125,000 oz Au. BLK has confirmed the successful implementation of the safety project management plan that facilitated detailed site inspections below ground. After extensive evaluation including a Geotechnical assessment, BLK personnel and independent technical consultants are confident the mine is ready for diamond drilling. The intended drilling program is in line with BLK’s focus on free-milling gold targets and resources in open pit or at shallow depth. Commenting on BLK’s entry into the Golden Age reef, BLK Managing Director Bryan Dixon said, “Re-entering Golden Age is an important step for us towards recommissioning the Wiluna Gold Plant on free milling ores. The high grade Golden Age reef will be blended with open pit Matilda ore to increase the average grade of the mill feed”. Mr. Dixon added, “Established underground infrastructure will enable mining to commence rapidly upon project development approval”. Recent financing and internal exploration news follows in quick succession to Rumble Resources’ (ASX:RTR) recent announcement regarding the start of its maiden drill program in joint-venture partnership with BLK at their Zanthus Project site in Western Australia. The Zanthus project, around 1,363km2 in size, is about 18km east of the recently discovered Nova nickel copper massive sulphide find by Sirius Resources NL (ASX:SIR). BLK retains 80% ownership of the Joint Venture with RTR retaining 20% but earning 75% of the proceeds. RTR has begun drill work by targeting a cluster of five bedrock conductors earlier this month. RTR expects to complete its diamond drilling schedule in the coming weeks and will inform the market of its findings thereafter.